When Edward Steer and Minnie Pateman marry they unite two families of gamekeepers on the local Estate. 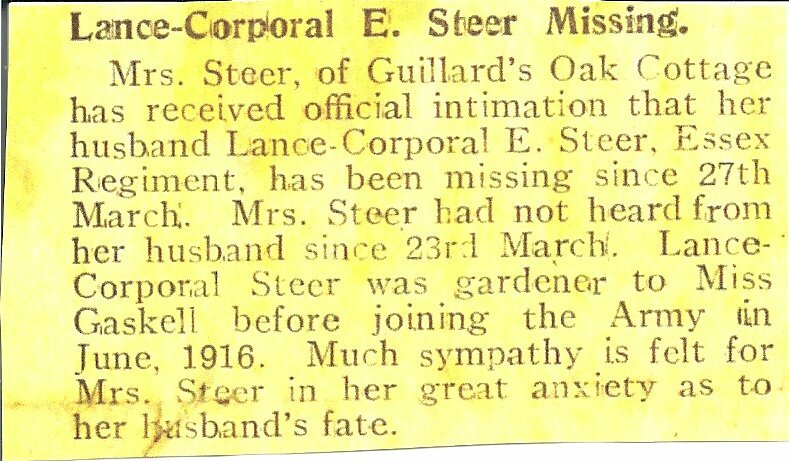 Edward Steer is listed on the Memorial Panels in Midhurst Parish Church and Easebourne War Memorial, although he and his family were living in Midhurst. Edward Steer was born in Kirdford, Sussex in 1880, the son of James and Elizabeth Steer. James Steer was a gamekeeper, born in Petworth, Sussex and his wife was a year older and was born in Peasmarsh, Sussex. At the time of the 1901 census James and Elizabeth were living at Henley Hill, Fernhurst, Sussex with two of their children: Lydia (15) and James (13) whilst their son, Edward (20), working as a gardener, was lodging at Hurlands Farm Cottages, Selham, Lodsworth, Sussex. 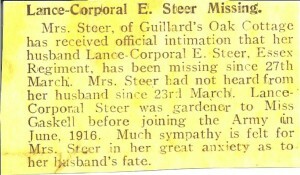 Edward Steer married Minnie Pateman in 1907 in Midhurst. Minnie, born in 1880 in Hutton Buscel, Yorkshire, was the daughter of Edward Pateman, also from Yorkshire, who by 1891 was living at Todham, Easebourne, Sussex, with his wife Eliza and six children. He was working as a gamekeeper. In 1901, Edward Pateman was still a gamekeeper with one of his sons as his assistant. The three eldest children, including Minnie, were no longer living with their parents but there were three additions to their family. Ethel (presumably Minnie), Pateman (19) was in service as a housemaid at 1 Grand Avenue, Hove, Sussex for Sir James Chance (87), a retired glass manufacturer. In 1911 Edward Steer (30) was working as a gardener and living at Guillards Oak, Midhurst, Sussex, with his wife and son. Edward Kenneth Steer was born 2 September 1908 in Selham. James Steer (63) was now a widower but still a gamekeeper and at Henley Hill, living there with unmarried daughter Elizabeth (34). Edward Steer enlisted at West Lavington, Sussex. The 9th (Service) Battalion was formed in August 1914 at Warley as part of 35 Brigade of the 12th (Eastern) Division. In March 1915, the Battalion was in training at Blenheim Barracks, Aldershot and once Divisional training was complete, they were mobilised for war and landed in Boulogne from 29 May to 1 June and were to spend the entire war (with very few periods of relief from the frontline) on the Western Front. By 1918 they had been involved in: the Battle of Loos (1915), the Battles of Albert, Poziers, and of Le Transloy (1916), the First Battle of the Scarpe, Battle of Arleux, the Third Battle of the Scarpe and the Cambrai Operations (1917). They were also involved in the First Battle of the Somme from 21 March to 4 July 1918. In these five months 90,000 men were quoted as missing. The emphasis on underground mines, blanket bombing and heavy shelling meant that many men were never found but huge numbers were captured by the advancing Germans. In total during WWI, 7,335 Officers and 174,491 other ranks were imprisoned. Of these, half fell into captivity between 21 March 1918 and the Armistice on 11 November. Edward Steer has been recorded as being buried in Berlin, so it is highly likely that he was one of that number. There were three POW camps in Berlin and very few details can be verified as many records no longer exist and in most cases only officers were named. The largest collection is held by the International Red Cross in Geneva but any access is strictly controlled. (It is hoped that the digitalisation of the collection will soon be completed and will then be open to all). He is stated to have died 29 June 1918 aged 38 in France, but other records show that he is buried in Berlin South-Western Cemetery grave XI.D.7. He is commemorated on the Easebourne War Memorial and on Memorial Panels in Midhurst Parish Church. Minnie Steer died aged 73 in 1954 in the Chichester district. Edward Kenneth Steer died aged 76 in 1984.